The average American has 634 ties in their overall network, and technology users have bigger networks. Social networking sites (SNS) provide people with the opportunity to friend members of their overall network of family members, coworkers, and other acquaintances. Much has been made of the use of the word “friend” in this context. Those who are listed as friends on SNS may indeed be friends in the traditional sense, but they can also be old acquaintances (e.g., from high school) or very casual connections between people who have never have met in person. Some worry that as a result of using these services, people may become more isolated and substitute less meaningful relations for real social support. Others believe this might enrich and expand relationships. Here below are our findings on all of this. Looking at people’s overall social networks, not just their online ties, the average American has 634 ties in their overall network, and technology users have bigger networks. Most Americans overall networks contain a range of social ties that consist of friends, family, coworkers, and other acquaintances. This includes a handful of very close social ties and a much large number of weaker ties. It is nearly impossible for most people to reliably list all of the people they know. This makes it very difficult to measure people’s total network size. However, social scientists have developed methods for estimating the size of people’s networks. The approach that we use is called the “scale-up method” . This approach has been embraced by social network analysts and its history and rationale are described in Appendix D. The method is based on the knowledge that the people a person comes to know in a lifetime are made up of various subpopulations (e.g., categories of people, such as family, doctors, mailmen, people named “Rose,” etc). If we know the size of a subpopulation from publicly available statistics, such as how many mailmen there are or how many people there are named “Rose,” and we know how many people a person knows from this subpopulation, we can make an accurate estimate of a person’s total network size.4 This approach assumes that the composition of people’s social networks mirrors the presence of a specific subpopulation in society (e.g., if one out of 100 people in the population have a characteristic, 1/100 people in a person’s network should share this same characteristic). average internet user has 669 social ties, compared with non-users, who have an average of 506 ties. Similarly, the more frequently someone uses the internet, the larger his network tends to be. The average person who uses the Internet at home several times per day, has a network of 732 ties, while someone who uses the Internet only once a day has a network of 616 ties. In addition, mobile phone users average 664 ties, and those who have internet access through a mobile device like a smartphone or tablet computer tend to have about 717 ties. Self-selection for social networking site platforms means that LinkedIn and Twitter users have larger overall networks. While the average person who uses a SNS has about the same number of social ties as the average American, there is considerable variation by SNS platform. Users of MySpace (694) and Facebook (648) have a statistically similar number of social ties. Users of LinkedIn (786) and Twitter (838) have significantly larger overall networks than Facebook users (see Appendix B, Table B2, for a detailed table). Once we control for demographic factors, most types of technology use are not related to having either a larger or smaller number of overall social ties (see Appendix C, Table C1, for the regression analysis). For example, LinkedIn and Twitter users have more overall social ties because of the demographics of their users. When we control for demographic factors, we find no difference in the size of people’s overall networks based on which SNS they use. LinkedIn users tend to have more friends because, unlike most social media, they are disproportionately male, and they also tend to have more years of formal education. At the same time, while Twitter users are more likely to be women than users of any other SNS, they are also disproportionately more educated. As a result, on average Twitter users tend to have larger social networks. Mobile phone use and instant messaging users are associated with having a larger overall network. Unlike the use of specific SNS platforms, the use of a mobile phone and the use of instant messaging services (IM) are associated with having more overall friends, even when we controlled for demographic factors. Mobile phone users have social networks that are on average 15% larger (an additional 73 ties) than those who do not use a mobile phone. Those who use instant message tend to have 17% more social ties than those without the internet and those who do not use IM (an additional 85 ties). We do not know if mobile phone and IM users have larger social networks because of how they use these technologies, or if they use these technologies because they have larger networks. It is possible that the relationship runs in both directions. Either way, if loneliness is measured by the deficit of social ties, we find no evidence that technology plays a negative role. On the contrary, the use of a mobile phone and IM are associated with larger overall social networks. Overall, Americans have more close friends than they did two years ago. We found that the average American has just over two discussion confidants (2.16). This is a modest, but significantly larger number than the average of 1.93 core ties reported when we asked this same question in 2008 . Similarly, 9% of Americans reported that they had no one with whom they could discuss important matters; significantly less than the 12% of Americans who told us in 2008 that they had no one with whom they could discuss important matters. In addition to fewer people being socially isolated, more people reported having more than two confidants than was reported in 2008. On average, one in five Americans added a new close social tie over the past two years (see Appendix B, Table B3, for a detailed table). The average internet user is less likely to report having no discussion confidants (7%), and they tend to have more close ties (average of 2.27) than non-internet users (15% of non-internet users have no close ties, and they average 1.75 discussion partners). SNS users are even less likely to be socially isolated; only 5% report having no discussion confidants, with an average 2.45 close ties. Facebook users have more close connections. However, as when we examined the size of people’s full social networks, much of the difference in core network size and the use or non-use of different technologies can be explained by the demographic differences between internet users and those on the other side of the digital divide (see Appendix C, Table C2, for the results of our regression analysis) . Education is one of the strongest predictors of having more close social ties. For example, those with a 4-year university degree average 12% more close ties than those with only a high school diploma (we also note that we again replicate a well-known finding on social networks, while women’s overall networks tend to be smaller; they have more close social ties – about one extra core confidant). Internet users average 14% more discussion confidants than non-users. Those who use instant message average 12% more core confidants than other internet users, or 25% more than non-internet users. The use of SNS in general was not found to have a negative relationship with the number of overall close ties. However, frequent users of Facebook have larger core networks. For example, someone who uses Facebook a few times per day tends to have about 9% more strong ties. To summarize, then, after we control for demographic characteristics, we do not find that use of any SNS platform is associated with having a larger or smaller general overall social network. However, we do find that Facebook users are more likely to have a larger number of close social ties. Facebook use seems to support intimacy, rather than undermine it. How much of Facebook users’ overall network is connected on Facebook? About half. Using our scaling-up method, we compared the size of Facebook users’ overall network to the number of people that they had friended on Facebook. We also asked Facebook users to report on how many of their Facebook friends were family, coworkers, neighbors, classmates or former classmates, and contacts from voluntary groups of which they are a member. The average adult Facebook user reports that they have 229 Facebook friends. When we compare the number of Facebook friends to the number of active social ties in people’s overall social networks, we find that the average user has friended 48% of his/her total network on Facebook. However, we also find something that at first glance seems unusual. 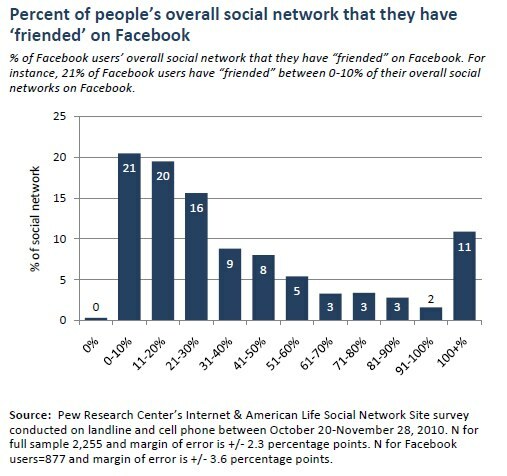 Some 11% of Facebook users report having more Facebook friends than their estimated overall network size. The largest single group of Facebook friends consists of people from high school. 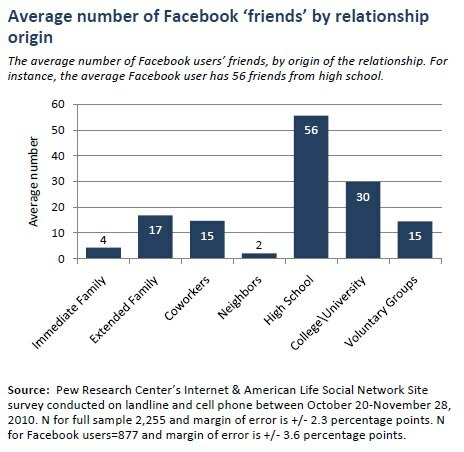 The average Facebook user’s friends list consists of 56 people from high school; 22% of their total friends list. This is followed by extended family, which make up 12% of people friends list, coworkers (10%), college friends (9%), immediate family (8%), people from voluntary groups (7%), and neighbors (2%). Over 31% of Facebook friends are not classified by Facebook users as family, coworkers, neighbors, classmates from school, or people from voluntary groups. We speculate that these remaining ties are predominantly dormant ties and friends-of-friends. 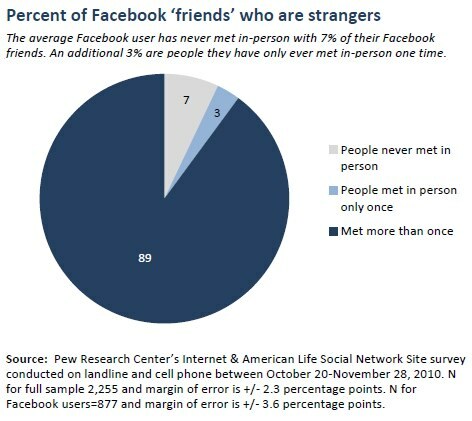 Only a fraction of users’ Facebook friends are people users have never met in person or met only once. A very small number of Facebook friends are people that we might refer to as strangers. The average Facebook user has never met in-person with 7% of their Facebook friends. An additional 3% are people they have only ever met in-person one time. While most people tend to have a very small core network of close social ties, a large segment of users maintain these ties using social networking services. Fully 40% of social networking site users have friended all of their core discussion confidants. This is an increase from 29% in 2008. 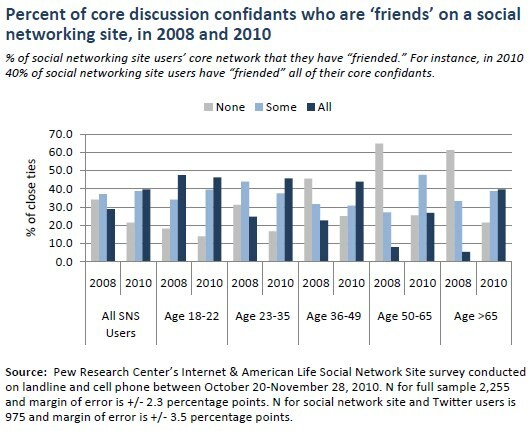 In 2008, it was primarily SNS users under the age of 23 who friended their closest social ties. In 2010, with the exception of those who are 50-65, 40% or more of social networking site users in all other age groups – including those over the age of 65 –have friended all of their core discussion confidants. Are social networking site users’ overall social networks less diverse? We measured the diversity of people’s social networks in terms of the variety of people they know from different social positions (this is a broad measure of diversity, not specifically a measure diversity in terms of people’s contacts with those from other racial or ethnic groups, or their political perspectives.) Our measure is based on the understanding that people in different social locations in society can provide different types of resources. People in high prestige positions tend to have social resources tied to income, education and authority, while those in lower prestige positions have special skills and can offer unique opportunities. The more different people someone knows, the more likely he or she is to have access to a range of resources. We asked people if they knew anyone in twenty-two different occupations that ranged in occupational prestige.6 We transformed these items into an additive scale that ranged from 0-100 to ease interpretability. The average internet user’s network is more diverse than those who do not use the internet. In 2010, the average American scored 42 on the scale of network diversity. This is identical to the findings reported in Pew Internet’s 2008 report on social isolation . On average, internet users (who score 43 on our diversity scale) have significantly more diverse social networks than non-users (who score 38) (see Appendix B, Table B4, for a detailed table). Self-selection for social networking site platforms means that LinkedIn users have more diverse social networks than users of other social networking site platforms. There is variation in the diversity of SNS users overall social networks depending on the platform they use. On average, LinkedIn (47) users have overall networks that are more diverse than those who use MySpace (37), Facebook (39), and Twitter (42) (see Appendix B, Table B5, for a detailed table). However, the difference in overall network diversity between users of different SNS platforms can be explained by the characteristics of users that are drawn to each site (see Appendix C, Table C3, for the results of our regression analysis). Controlling for demographic factors, we find that internet users score just over 3 points (3.3) higher on the scale of diversity. But we find no relationship between the use SNS and the diversity of people’s overall social networks – use is not associated with a more or less diverse network. Nonetheless, we do find that those internet users who maintain a blog are likely to have slightly more diverse networks. The average blogger scores more than 3 points (3.4) higher than other internet users. How strong is the relationship between internet use and the diversity of people overall social networks? Education is the best predictor of a diverse social network. Each year of education is associated with 1.5 additional points on the diversity scale. From this perspective, internet users have a boost in network diversity that is equivalent to about two years of formal education, bloggers have a boost of about four years.